LOS ANGELES, May 24, 2017 (Aerojet Rocketdyne PR) — Aerojet Rocketdyne, a subsidiary of Aerojet Rocketdyne Holdings, Inc. (NYSE:AJRD), was selected to provide the main propulsion for the Boeing and the U.S. Defense Advanced Research Projects Agency (DARPA) reusable Experimental Spaceplane (XS-1). Aerojet Rocketdyne is a member of the Boeing team that recently announced an agreement to collaborate with DARPA to design, build and test a technology demonstrator for the agency’s XS-1 program. 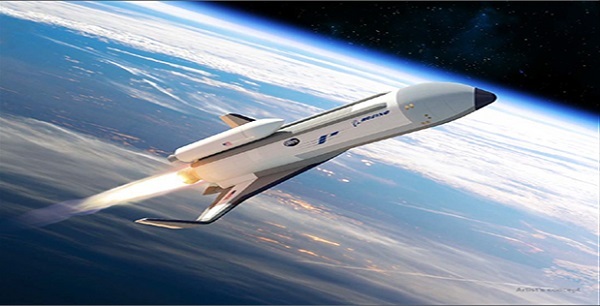 The reusable experimental spaceplane is designed to deliver small satellites into orbit with high launch responsiveness. The main propulsion is based on the legacy space shuttle main engines (SSME). This isn’t exactly what I originally had in mind back when I was in favor of preserving SSME production and hydrogen launch capabilities for new reusable launch vehicle development, but I guess it beats tossing them four at a time into the atmosphere and ocean at orbital velocity, with no thermal protection or landing capabilities whatsoever. Ahem. You know. If Aerojet doesn’t screw up this propulsion development project it just might work for them. An engine built from 35 year old parts laying around AR and NASA facilities. What could possibly go wrong. And this thing is supposed to be A) affordable and B) rapidly reusable. Hah! Is the AR-22 SSME variant going to have the same startup characteristics as the RS-25 SSME? In other words extensive ground support equipment required for ignition and and no re-ignition in flight. So you have a very expensive glider at landing. So I guess A-R had a yard sale and Boeing made them an offer on a box of old rocket parts. Let’s hope our old rocket parts are better than the Russians’ old rocket parts. The SSME simply cannot be (re)started in flight. That’s why it was dropped from the second stage of Ares I and the J-2X was developed to replace it. Yeah, but the SSME is anything but “cheap”, so that part of this vehicle won’t be making any progress towards cheaper launch. But, this is only an X-vehicle. Still, Boeing did buy Rockwell International (builders of the shuttle orbiters) years ago, so it’s not surprising that Boeing would go with the SSME for this proposal. It’s an engine they know how to design a vehicle around. To be fair, the SSME uses autogeneous pressurization but still requires a lot of helium to start, and this, from my understanding, is an entire new engine in development in a new era of high powered computers, additive manufacturing, etc. So if they don’t produce another RS-68, like I said, this could work out for them. It’s not surprising that Boeing chose a Hydrogen engine for this craft, and it’s also not surprising that they went to their old Rocketdyne division to find an engine. We know why Boeing got into this program in the first place – it has long and amply demonstrated it will go after pretty much any opportunity to lay hands on government cash. Whether a particular project has any discernable future isn’t, it seems, a consideration. The Phantom Express airframe, as described, appears to incorporate technology that could have future applications, but the engine choice is just the latest example of the fundamentally backward-looking chintziness anent rocket engines exhibited by all the legacy aerospace majors. Phantom Express’s engine isn’t an R&D project so much as a classic car restoration project – likely including the large percentage of total effort needing to be devoted to scrounging suitable spares. DARPA might have done as well or better subcontracting AS-1 propulsion out to Jay Leno’s Garage. The Phantom Express will be able to be operated as a singleton article – or, at best, a pair like the X-37B’s – until either age or mishap rings down the curtain. But it will not be something that can be “transitioned” to commercial service in any robust way absent an expensive engine replacement process. DARPA is showing disturbing signs of becoming NASA 2.0. I think I read on one of the myriad threads about this around the ‘net that Boeing (DoD?) have the option to produce up to 20 of these when they are thru development. While this is being framed as an experimental technology development project, its obviously intended to produce a functional product. Similar to how PAVE BLUE led directly the the F-117. I think its a DARPA instead of USAF because, besides being “out there” technologically, DARPA is better at slipping under the political radar about cost overruns and failures. As it seems quite unlikely there are anywhere near 20 sets of parts for pre-SSME prototype engines lying around, one has to wonder how seriously Boeing takes such an “option” even assuming it’s real.